This Durban beach hotel in South Africa is located on the North Beach and overlooks the Golden Mile and Indian Ocean. Southern Sun Elangeni & Maharani can be found at 63 Snell Parade in Durban. The hotel is only 1,8kms from the Durban International Convention Centre, 1,2kms from Suncoast Beach and 0,1kms from North Beach. On exit from airport, one proceeds south along the N2, take the first left off ramp to Umhloti proceed about 2km, turn right onto the M4 now called Ruth First and proceed south for about 22km, you will pass through the Sibaya circle and just continue straight along this M4. 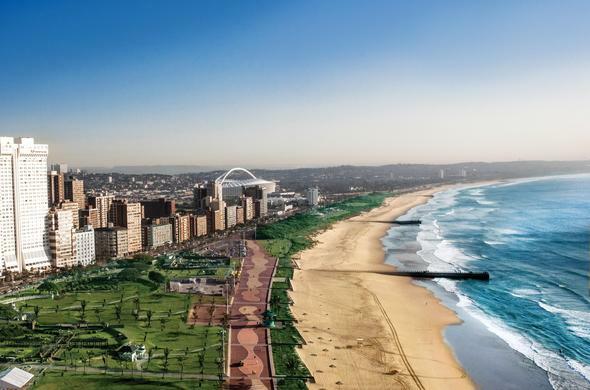 When approaching Durban you will pass the Moses Mabhida Stadium on your right and the Suncoast Casino on your left. At the traffic intersection continue straight through, take the first left into Somtseu Road, cross over Brickhill Road and then take first right into Playfair, left into Moyneux, keeping left and Southern Sun Elangeni & Maharani is on your left.